Even cheaper with subscribe and save. Product DescriptionOur fine Extra-Virgin Ceylon Coconut Oil is made by cold-pressing coconut flesh. This means that it is raw, maintaining all the natural goodness of the coconuts! Bottled at source, our coconut oil is high in Lauric Acid and other medium chain saturated fats beneficial for the body. Its mild and sweet aroma does not overpower your cooking, and a delicately smooth texture once melted. Coconut oil can be used in a variety of ways: in your cooking and baking, to moisturise hair and skin, as a natural make-up remover, and as a shaving balm or moisturiser for babies. 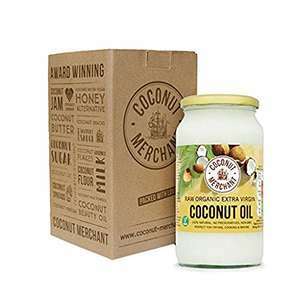 This 1L jar is perfect for the home, the kitchen, and for all your daily coconut needs. Does anybody else find the litre jars too difficult to get to the oil at the bottom? There's no such thing as 'extra' virgin coconut oil. Hence I'd steer well cleat. There's no such thing as 'extra' virgin coconut oil. Hence I'd steer well …There's no such thing as 'extra' virgin coconut oil. Hence I'd steer well cleat. I bought this before and it seems like good quality cononut oil to me.